— Pastor Gaylon Clark, Greater Mount Zion, Austin, Tx. The work on ourselves never ends. I'm celebrating over 3 years of sobriety and over 5 years of being born again. It's been a very challenging road of faith, failures, triumphs and therapy. I feel I have only just begun to understand my path. God bless you all.
! was born to Gilbert and Christina Saucido in Phoenix, Arizona. Shortly after, Mom made Los Angeles our home. I loved our road trips during the holidays over the years. My Mother would sing so beautifully to the music we played on the cassette player. Those road trip playlists included Jackson Browne, Joni Mitchell, James Brown and Edye Gorme y Los Panchos. We sang, mile after mile, till the mind and muscle put those songs to memory. Favorites included "Sabor a Mi", "La Media Vuelta" and "La Historia de Amor". Again these trips were the birth of my cosmic meaning, to entertain, some how. My Father, always ahead of the curve in music, fashion and sports; exposed me to the B52's, Prince and our ongoing love for the Los Angeles Lakers and Dodgers. I was trained in ACTING, dance and writing thru high school in Santa Monica. In college, Cal. St. LA., I majored in Theatre Arts and minored in Chicano Sociology as my culture and community have always been very important to me. In my 20’s I ran a theater company, LA Teatro, that was creatively fulfilling but was a harsh lesson in the realities of daily living and finances. In my 30’s I began getting roles in commercials, TV and Film. Roles included speaking parts on Reno 911!, Friday Night Lights, Prison Break, From Dusk Till Dawn and the indie film hit Dance with the One. You can currently catch me in the film TRUE TO THE GAME. But with all these accomplishments, my soul had not been taken into account and my ego craved on the externals; status, fame and quantity of friends. It was an unfulfilled life. During this same time I also would produce music charity events where we raised money for many worth while causes from Public Libraries to valuable after school programs for Latino children in depressed areas. In my 30’s, I discovered the martial art of Brazilian Jiu Jitsu and became fascinated with its positive affects on my life. In the thirteen plus years of training I earned the rank of black belt in the fall of 2015. During a challenging time of my life this martial art, along with my born again commitment to God, helped me get thru the darkest of days. Through God's strength and the help of dear family and friends, I was able to start to a small business Zen Fit, 2010-2017, a martial arts school in Austin. We have served our community proudly over the past 4 some odd years. We have housed homeless on many freezing nights. We have given scholarships to students over the years. We have held events for Second Chance Democrats and Texas Advocates for Justice. As an ex-con, I believe in the power of second chances and that the justice system must be reformed to better aide those who have paid their debt to society. or more information on causes dear to my heart, visit my GET/GIVE page. With my faith in God's love and my sobriety, I have built a humble life of serving others as I strive for spiritual progress. I continue to write poetry, stories and film scripts, including the award-winning short, From Eva With Love. When I'm lucky on occasion, I get to do my first love, acting. I'm so grateful for the love and support I receive from my family, friends and fans. .
I’m grateful and excited to announce www.zenfitvod.com. This site is a subscriber-based videos on demand of all the fitness drills and techniques I’ve learned over the years. Enjoy! With my Father , Gilbert Saucido. Jan, 2017. 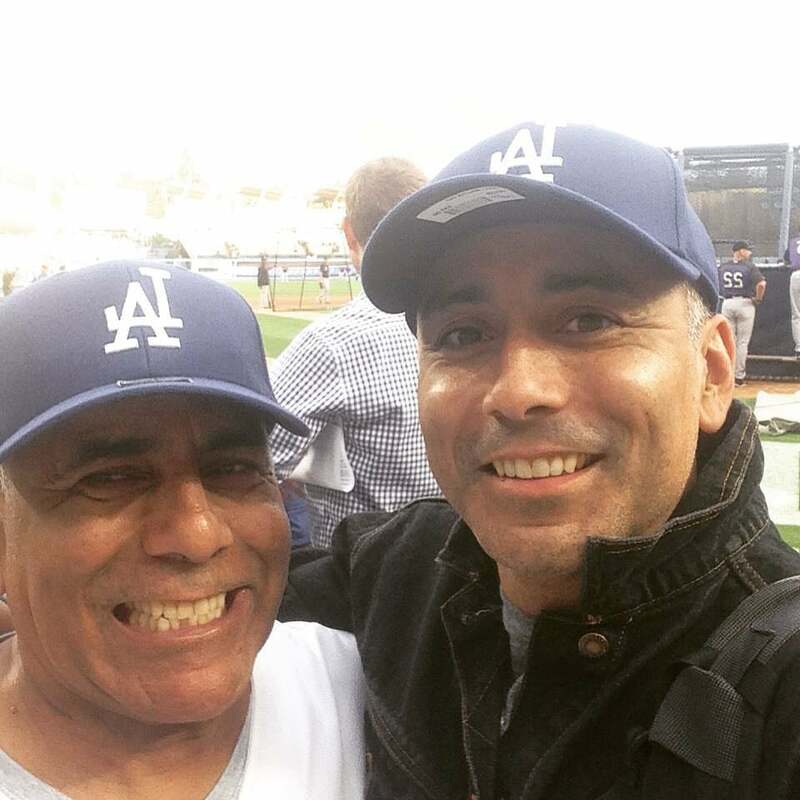 With my Father, Dodger Stadium. Sept. 2015.